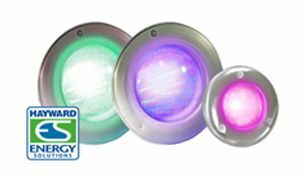 Hayward gives you gorgeous LED lighting options to help you create a magical outdoor environment. Whether you’re in the mood for a peaceful retreat or a party vibe, you can create a backyard ambiance that is uniquely you. Hayward pool and spa lighting incorporates innovation and technology as the leading underwater light industry. They provide brighter, more vivid colors. Amazing light shows that are energy efficient. Plus feature rich options for pools and spas. Whether you're looking for a light for new constructions or an upgrade to retrofit - Hayward has a light for you!